No matter how much a minimalist lifestyle appeals to me in theory, the reality of it is that my kids have a lot of stuff. Some days it feels like there are toys, toys everywhere. 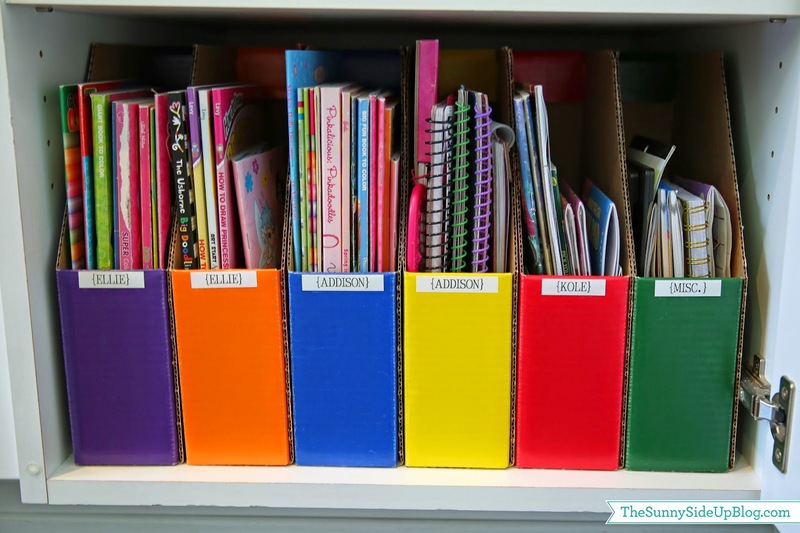 Fortunately, a bit of organization makes the kids’ collections feel a lot more manageable for all of us. I’ve found that a few simple DIY solutions are all it takes. Read on for inspiration for getting your kids’ toys in order without breaking the bank. An over-the-door shoe organizer is a convenient way to store things, not just footwear. Their clear pockets are just right for sorting small items and you can see what each pouch holds. 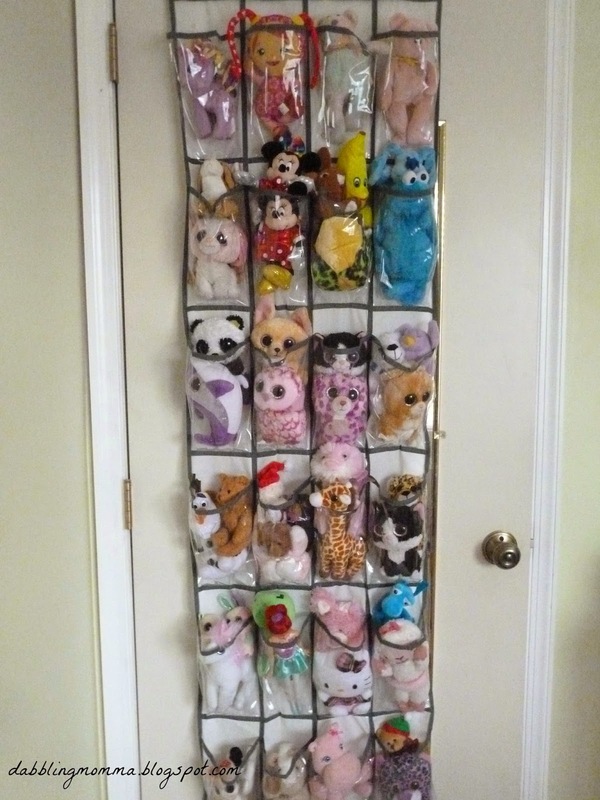 DabblingMomma suggests that these organizers are a good way to get small stuffed animals off of the floor or the bed. They are also useful for small cars, bouncy balls, trading cards, and craft supplies. Plastic bins in various sizes are invaluable for organizing small toys. These are available with and without lids, in clear and colored varieties. Clear, lidded bins are often best for toy storage since you can see the containers’ contents and stack them on a shelf. 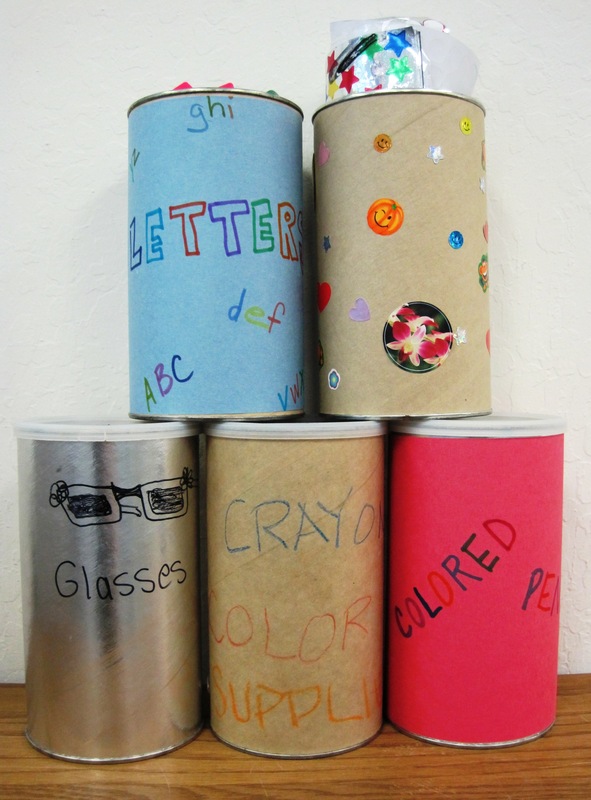 DIY & Crafts advises that dollar stores are one of the best places to buy small plastic bins at a reasonable price. When kids have a place to hang their dress-up clothes, it is easier to keep them organized. A row of hooks on the wall can do the trick. As Ashfromscratch points out, in addition to being organizational, a row of hanging costumes adds a pop of color to a room. Happy Brown House also suggests using foam tape to hang clothespins to the wall so that kids can clip and unclip hats. You could, of course, use pop-up hampers for storing clothes in need of washing, but Household Management 101 says that these lightweight containers are even better for stashing bulky toys. Stuffed animals and balls are two of their suggestions. Plastic coffee cans with resealable lids are a handy place to store small toys. Heart of Wisdom offers printable labels designed specifically for these cans. Use them to identify storage for plastic army men, interlocking building blocks, crayons, and small race cars. To remove the coffee smell, wash the canister and let it sit overnight with baking soda inside. Large and sturdy, cardboard diaper boxes can hold all sort of kids’ stuff. By covering them with fabric first, the boxes will look stylish and match the decor of your kids’ room. According to Erin Spain, it takes about one yard of fabric to cover the outside of a diaper box. If you have sewing skills, this can be a stitched project, but if not, no worries: Accidentally Wonderful says you can wrap the box with the fabric like you would a gift and just glue the material in place. Cardboard magazine holders are a low-cost way to store skinny items. My kids have beloved magazines that they read again and again. Because they get so much use out of them, I’m willing to save them but only if they keep them tucked away in magazine files when not in use. Ask Anna suggests using these holders for coloring books. Comic books would be right at home in one too. Giving old furniture new life takes more work than some of the suggestions on this list. But if you’re willing to invest a bit of TLC, the finished result will be both attractive and functional at a fraction of the cost of buying new furniture. 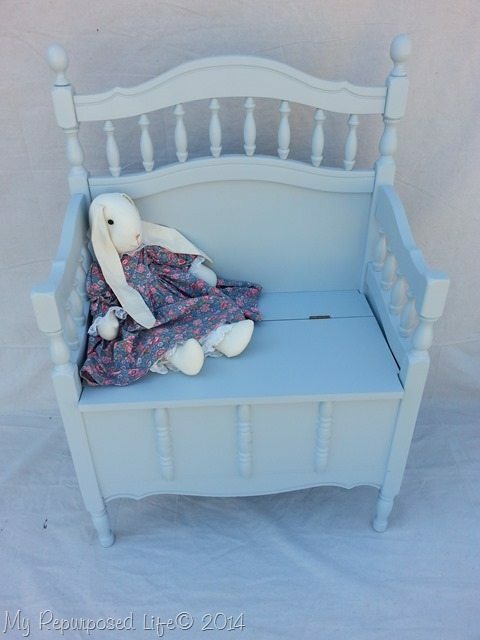 My Repurposed Life offers advice on turning an old crib into a storage bench that’s just right for housing kids’ toys. My son has a tendency to collect junk under his bed, but providing organized storage for that area clears the problem right up. 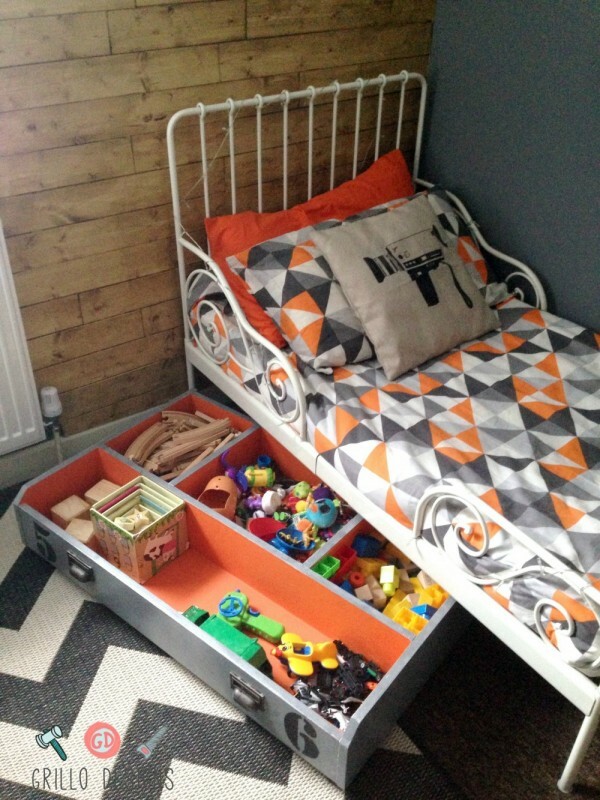 Under-the-bed totes or bags are one option, but, without dividers, they can easily become cluttered catch-alls. Instead, try making a divided drawer. By mounting casters to the bottom, your children will be able to easily slide the drawer in and out. You can find DIY directions from Grillo Designs. Tub toys present a tricky situation because they need to hang in a spot where they can drip dry. Someday I’ll Learn suggests hanging waterproof hooks on the side of the tub and sliding vinyl-coated wire baskets over the hooks. The open bottoms of the baskets allow for plenty of ventilation as the toys dry. This tip isn’t so much a storage system idea but a piece of friendly advice. No matter how many organizational tricks you put into practice, if your kids just plain have too much stuff, it is going to be awfully hard to keep it neat. I need this reminder just as much as the rest of us. Letting go of stuff can be hard, but it is also so freeing. Money Crashers suggests listing old toys on Freecycle or donating them to preschools, the Ronald McDonald House, or resale shops. You can also hold a garage sale and sell them yourself. Are you ready to sort, store, and shelve toys yet? I’m always amazed at how easy it can be to get my kids’ playthings in order. Which project are you going to tackle first? Leave your comments below, and feel free to suggest a few toy-organizing strategies of your own.